Before I get into stampin' chit chat, I just have to say thank you to everyone who has visited my blog, posted comments and subscribed to it. I am lucky enough to work very close to home, so I usually come home everyday to eat. Well, now I am finding myself checking my blog and reading emails on my lunch hour! I'm addicted to my blog! You guys are awesome and I hope you keep visiting. I will be posting some blog candy in the very near future! Okay, let's talk BELLAS! I can't seem to get enough, can you? This little bella is Cuppacakeabella. Isn't she adorable? I actually made several versions of her and was the happiest with the pink and brown combination. I need to play a little more with my color combinations. One of my resolutions this year is to use more patterned paper. For some reason, I am very unsure of myself when I use it. I guess I'm a simple kinda girl and I always end up second guessing my projects when I use it. If I use patterned paper, I use very little of it or I use it on more 3D objects instead of cards. I have tons of it that is begging to be used, so that's my resolution this year! 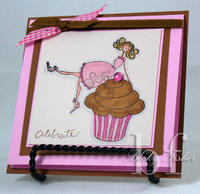 i love this card...and i am loving the bellas too! i will have to get some for myself soon! Hey girl! Very cute! LOVE it!! !